LLC 12-Volt LiFePO4 Battery features the 38120HP cells. The battery can be used as a replacement for your vehicles standard battery or as an additional battery to provide the extra power needed for high performance aftermarket sound systems. Battery is capable of 1200CCA at only 13 lbs. and is good for over 1000 cycles to 100% DOD, and to 2000 cycles to 80% DOD. Q: How will the LiFePO4 battery be affected by the charging system of the car? A: The LiFePO4 battery is not affected by the charging system at all. Majority of the cars’ charging systems charge up to 14V or 14.4V. This represents the charging level of 70% to 75% for the LiFePO4 batteries. Q: Will the car charging system overcharge the LFP battery and shorten its life? A: No. The overcharge for LFP battery is above 17V. There is no way to reach this voltage in the vehicle. As the LFP battery has no memory effect, it can be charged any time to any capacity. There is no shortening of the life-span when using as a starting battery. In addition, we build the battery with balance boards to ensure that the battery is not over charged. Q: What is the starting time for the ICE when using a LiFePO4 battery? A: The starting time for any fuel engine is given by the vehicle manufacturer. Usually it is about 5 to 10 seconds. This time is the same for LFP battery. In any case, the fuel engine should not be started with long starting attempts. Please see the vehicle instructions for starting the engine. Q: What is the max current available from the LiFePO4 battery? 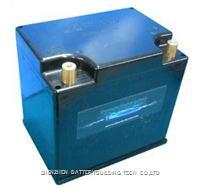 A: The 12V LiFePO4 battery can release the energy very quickly without any limitation. The peak short connection current may reach above 1000A. Unlike lead-acid batteries that are limited by the Peukert’s law (http://en.wikipedia.org/wiki/Peukert’s_law), the LiFePO4 batteries do not have any such limitation. However due to the high energy release, the LiFePO4 batteries should not be extremely discharged for longer than 15 seconds.